At least part of what Aikidoists call the One-Point, center, or harct, is what physicists call the "center of gravity," the point where gravity acts on the body as a whole. When the normal human stands upright in a normal posture, the center of mass is approximately between the spine and the navel. The vertical location of the One-Point is commonly said to be about two inches below the navel. If you fold your hands in front of you and drop them to your abdomen, your little fingers will be approximately at your One-Point — sometimes. Actually, the One-Point is not a rigid, precisely defined point nor is it to be "kept" in its place. It is in different places in people of different size and body build and it is in different places in one person depending on what that person is doing in the sense of dynamic equilibrium. It may even be outside of the body. A standing immobile body is stable as long as the One-Point remains over its support — the feet. If the center of mass moves outside of its support (the feet) gravity pulling on that point creates an imbalance. An additional tug by the tiniest person can produce spectacular results. 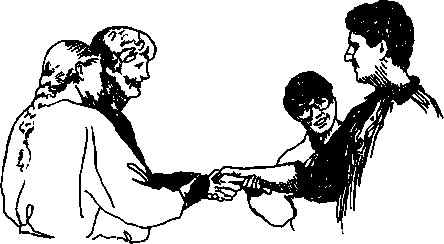 Shin-Shin Toitsu Aikido emphasizes coordination of mind and body to produce inner strength and stability. A person with mind and body coordinated conveys an image of indefinable calmness and stability. Ki testing defines that state of calmness and stability through exercises known as ki tests. Although it is impossible to test the mind directly, the mind can be tested through the body. 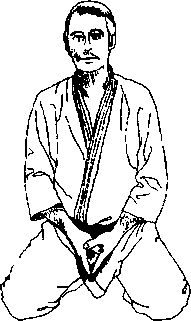 The point of testing is not to see if uke (the tester) can defeat nage (the one performing the technique). Ki testing is not a physical contest but a demonstration of nage's current state of mind-body coordination. Uke serves as a biofeedback sensor to aid nage in learning new concepts of strength, and calmness, and stability. This relationship between mind and body, body and spirit is the secret behind Aikido and other martial arts and even offers a testable, sensible rationale for positive, creative, everyday living. Exercises are grouped according to the four basic rules for practice of Mind-Body Coordination. This arrangement is somewhat artificial as all of these principles work together. With any one of the principles you can pass any ki test; on losing any one, you can fail any ki test. Each of the rules below is a natural extension of the one before. The point of testing is not to demonstrate spectacular strength or dramatic failure — just a difference. Perhaps a tiny, subtle increase in firmness. A slightly longer period of resistance. Perhaps no difference to uke, but less effort by nage to maintain stability. Uke can increase the challenge in small increments as nage learns and improves until the differences are spectacular indeed. Because a strong nage may easily resist the efforts of a physically weaker uke without resorting to anything faintly resembling the point of the exercise, partners should be of approximately equal physical strength or the stronger partner must take care to be particularly sensitive. Testing should never deteriorate into a wrestling match. Ki testing is a teaching tool, not an attack (for which we would use Aikido echniques). A fierce rush of mass and motion is not dealt with only by extending ki unless there is no other option available. If, for example, a large oncoming mass has Mack emblazoned across the grill, we do not stand in the middle of the road extending ki; ideally, we extend ki — and step aside. Does it really work? Try it and see. Believe nothing, O monks, merely because you have been told it Do not believe what your teacher tells you merely out of respect for the teacher. But whatsoever, after due examination and analysis, you find to be kind, conducive to the good, the benefit, the welfare of all beings — that doctrine believe and cling to, and take it as your guide. Ki testing is sometimes dismissed by baffled onlookers as mere "programming" or some form of hypnosis. It is actually a means of revealing previous programming for what it is. Our minds are pro. grammed with astonishing ease. Don't believe it? Ask a friend or a group to repeat this series aloud: 10,10,10,10, 10____"
Ask a friend or a group to repeat aloud: "Pots, pots, pots, pots, pots____"
Ask this question: "What do you do at a green light?" Next question: "So what do you do at a red light?" Ask: "What does F - O - L - K spell?" Ask: "What is the word that means to feed a fire?" Ask: "What is the word for the white part of an egg?" You can program or be programmed to weaken yourself with negative self-defeating thoughts as easily as you just programmed someone else to think that aluminum cans are made of tin, that we stop at a green lights, or that white is yellow. — Henry Ford rnatural Powers. The distinction between natural and supernatural is so often misused and misunderstood that it is useful to look at the words. Latin natus, past participle of nasci, to be born) means "as born" hence the kinds of skills and abilities which we expect most normal people to have or not to have. Natural means: "We are familiar with this." quot;We don't have a mechanism that explains how this observable but disturbing phenomenon might operate, therefore it must not be true." • Any ability above or beyond those that standard human beings appear to be "born" with. Things appear "supernatural" when understanding is lacking or incomplete. But fact is fact, and power is power, whether we understand it or not. We are "born" with far more than we sometimes realize. A newborn can put an amazingly strong grip on your finger despite being a tiny "weak"
baby. Most beginners can perform basic ki exercises in seconds — it is only when they start thinking about it, doubting it, "knowing" that it is impossible, that their ability stalls to waver and weaken to the point that they must relearn what they already knew how to do the day they walked in. 101 - Truth is that which is true — whether you know it or not and Wether you like it or not. Faking. So if not "programming" or weird "supernatural powers" the results of testing must be fakery, pure and simple. Well, they can be. That is why you must always test the tester. It is very easy to unconsciously (or consciously) change the force, direction, 01 other characteristic of the test to obtain a desired end. Having fallen into any one of these temptations, uke may have made his point, but has not performed a true ki test — he did not test what he claimed to be testing. The flip side of this problem is the nage who "knows" he is supposed to "be weak" under particular conditions or "be strong" under others and so collapses or stands firm according to script. One partner tries to break the laws of physics while the other one pretends that he has. This makes for great theater but it is not ki testing. It is also tempting for nage to counter the expected energy ("Ha-ha, you can't get me!") 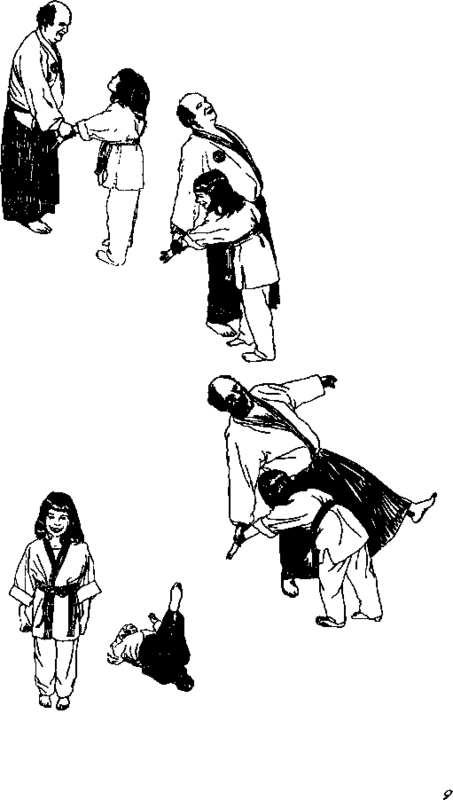 This is why every Aikido technique works about twice with beginners. As one of the worst all-time offenders in this category, I can say that this is a profound misunderstanding of the nature and purpose of ki testing. Ki testing is not a contest, but an evaluation in which uke has kindly consented to serve as a biofeedback detector of nage's internal state. Nage thinks of a co-worker he dislikes. Uke test. Nage thinks of an especially happy day. Uke test. Nage chooses to think of one or the other. Uke test. From the results uke tries to guess which topic or what combination of the two nage was thinking of. Nage then confirms or does not confirm uke's conclusion. This approach removes all temptation for uke to load or skew the test in any way and provides essential reality testing for nage. When preparing the first printing of this book, I assumed that it would be orimarily of interest to Ki Society students with instructors to take them through the testing process It turned out to have afar broader range of readers than I had anticipated and many took me to task for the rather sketchv testing instructions. One was Jan Beyen of Belgium who patiently kept at me for a better explanation and in the process helped develop afar better explanation ofki testing more effectively1 q. We tried ki tests once. Why didn't they work?